COUNTRY THUNDER MUSIC FESTIVAL ROLLS INTO KISSIMMEE, FLORIDA THIS WEEKEND | 2911 Enterprises, Inc.
Superstars Luke Bryan, Toby Keith, Luke Combs And Many More Invade Osceola Heritage Park This Weekend! 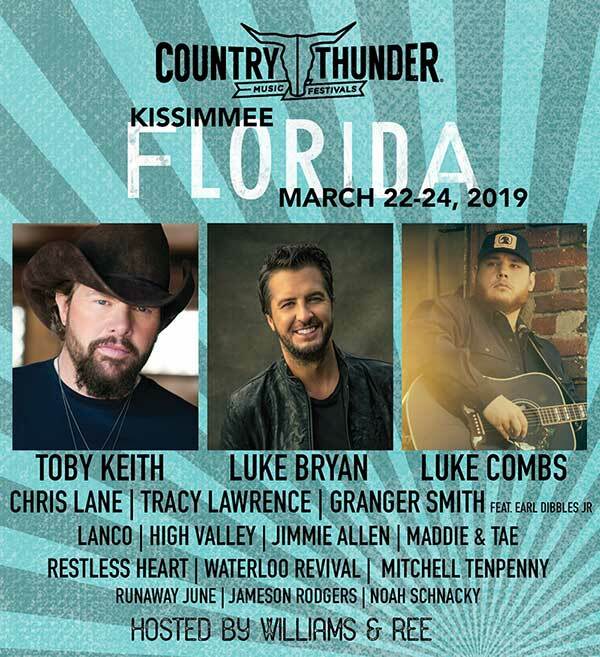 KISSIMMEE, Fla. – Final details, stage lineups, and fan information is out now for this weekend’s Country Thunder Florida 2019! The inaugural Florida event rolls into fabulous Osceola Heritage Park in Kissimmee, Fla. March 22-24. The timing could not be better – 10 ACM nominations for CT Florida artists, and the sensational Luke Combs enjoying his fifth straight No.1 hit, the forecast could not be more perfect and the lush, green surroundings of the massive festival site in Kissimmee make this the perfect weekend for Country Thunder Music Festivals’ Florida debut! The massive stage is well into its three-day construction, the gigantic Electric Thunder tent is up, the endless array of food, beverage and retail vendors are arriving in droves and the atmosphere among Florida’s country music faithful has already reached a fevered pitch. Toby Keith, Luke Bryan, and Luke Combs will headline the festival, with Chris Lane, Granger Smith, Lanco, Tracy Lawrence, High Valley, Mitchell Tenpenny, Maddie and Tae, Jimmie Allen, Runaway June, Restless Heart, Waterloo Revival, Jameson Rodgers, Noah Schnacky, Scooter Brown and more will shake the massive main stage all weekend long! Over at Electric Thunder . . . more live music, line-dancing, games, DJs and more. In addition to three days of the biggest and best acts that country music has to offer, the RAM National Circuit Finals Rodeo will also take place during the festival just a few steps away at the Silver Spurs Arena. Three-day GA passes (including a new standing room area which allows fans to get up close and personal with their favorite CT stars), reserved seating, Platinum Experience, camping, glamping and all the extras are available by visiting countrythunder.com. Order by phone at 1-866-388-0007. Facebook, Twitter and Instagram all @countrythunder. Fans can the get latest and greatest festival information in the palm of their hand, on their favorite Android or iOS device. Click here to download the brand-new Country Thunder app today! The Country Thunder Music Festivals organization has a 15-year history which boasts four other major multi-day events in North America, including the reigning ACM Festival Of The Year in Arizona. The organization also hosts events in Wisconsin, Alberta and Saskatchewan. What kind of parking passes do you offer? We’ve got ’em all! If you’re parking on your campsite, please see information regarding extra vehicle passes under our “Services” page, or by clicking here. There will be a complimentary shuttle courtesy of iTouchOrlando. Shuttles will depart from Pointe Orlando (9101 International Drive Orlando, FL.) When you arrive, park at Pointe Orlando and head to the iTouchOrlando Welcome Center – Suite 1152. Campground check-in will be Thursday, March 20 through Sunday, March 24 from 9:00 (AM) to 9:00 (PM). The concert area opens at 1:00 (PM) on Friday and Saturday and at 1:30 (PM) on Sunday. To view the entire festival lineup, please click here.